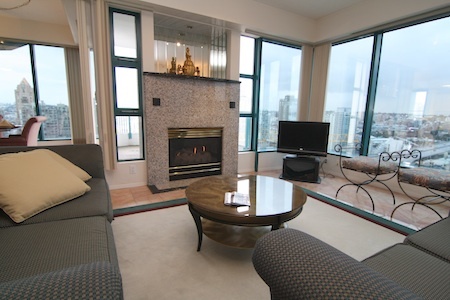 The Viva A is a one bedroom spacious condo and offers central air conditioning and heated marble floors. Kitchens that are filled with the best appliances such as a Jenair grill and a Sub Zero refrigerator, a dishwasher and microwave. The kitchen is spacious with beautifully crafted cupboards filled with all the amenities that a chef could need. The living room area is filled with comfortable furnishings, when it is time to work there is a desk with wireless internet connections. The television with its accompanying DVD player or the CD player and stereo is perfect for relaxing, along with dimmer control lighting and individual heating controls. If all these comforts are not enough there is the bedroom that is relaxing with a king sized bed, window treatments for restful sleeping and large mirrored closets. The bedroom also includes a television for being entertained while snuggled in an elegant duvet. The bath facility in this one bedroom deluxe includes a large tub for soaking in a bath, a hair dryer, halogen lighting as well as other quality amenities in the bathroom. The dining room is complete for entertaining dinner guests with a large table, dimmer controlled lighting to set the mood and a spectacular view of the city and the breath taking mountains of Vancouver. 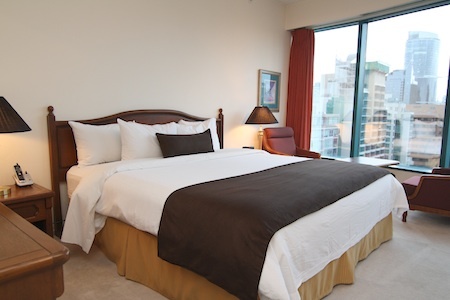 This 786 square feet suite offers a beautiful city and mountain view.